OCEANSIDE, Calif., Jan. 26 /PRNewswire/ — How can a little indie film with no major actors, no real TV advertising, and little attention from the mainstream press catch the attention of 215,000 teenagers who came out opening weekend? How can it also have the #1 fan rating today on Fandango.com and Flixter.com? In comparison, To Save A Life was neck and neck with teen horror flick Daybreakers, however To Save A Life was on less than a third of the number of screens. A similar story occurred with Youth In Revolt, which was on 300 more screens, yet To Save A Life grossed nearly $700,000 more. Big Hollywood.com, on the making of the film, states, “To Save a Life is perhaps even more a miracle than the average feature film. Not only did it beat the odds, it did so with its soul still firmly attached.” In contrast to more typical teen fair, such as Youth In Revolt and Daybreakers, it begs to ask the question – are teens looking for more? “I was thinking as I was approached about this film, why aren’t we creating films that can actually make a positive change in the life of teens, movies that don’t just entertain, but also make an impact in the lives of the viewers?” said Brian Baugh, director of To Save A Life. Exit polls from teens after having seen the film show they want be challenged. And, they feel typical Hollywood films aren’t inspiring them to make their schools a better place. Not only do box office numbers speak loudly, but the social media sites prove this point. The movie’s official Facebook page jumped over 30,000 users in the last five days – with over 90,000 active users. This number, compared to Youth In Revolt’s 42,000 fans, and the Book of Eli’s 44,000 fans, is compelling. Now, local splinter groups are breaking off, creating To Save A Life groups for their own communities. Teens are coming together on the Facebook site, talking about their lives, their struggles, and inspiring each other to reach out to the hurting and lonely in their communities. Nicole- This movie saved my life, last night i attempted suicide but didnt succeed and my confirmation sponsor asked if i wanted to go see it today and as much as i didnt want to i did, and it made me think so much. I have been where jake was on top of everything and no matter what was happening in your life i always had a smile on my face but i have also been in jonny’s position too, i used to cut, people just dont no peoples breaking points and i wish people could just be who they want to be without being judged or doubted on your abilities. i was, and now i realize if you trust in the lord and just do the right thing, you will be just fine. Mark – IN 6th grade i felt alone. i didnt feel like anyone liked me. today, i still feel like some people are just acting nice to me. i dont know what to do. i feel alone a lot, and i dont know what to do. Please help me. The movie was great and got me thinking that other people are just like me. I still feel alone, please help me. Missy – I cried when I saw the movie, because I want real life to be like that. I never had anyone to turn to when I was depressed, and I still don’t. I don’t cut myself and I don’t try to hurt anymore, I’ve made a few friends but none of them have seen me hurt. I hide it all in a mask of shame, but I’m going to take off the mask, finally I’m gonna start and I’m gonna help other people, I’m gonna help myself too. No longer will I just be [Missy], I’m going to be known to save a life. Because of this movie. You inspired me. Dale – When I was in junior high, I was bullied to the point of suicidal thoughts. God is who stopped me from following through. I had previously just pushed the memories behind me and acted like nothing ever happened, but now I want to do something. I want to make sure no one else feels the way I once did. This movie changed the way I look at life. Save a Life! Sara – The To Save A Life Story means a lot to me, because I was the one that needed saving last year. If people could only understand how far one small act of kindness could go, the world would be a better place. I love that this movie is bringing real-life issues that people rarely talk about to light and showing teens how to deal with them. You never know who around you feels he is the outcast – treat others as you would want to be treated. Save a life. This movie is going to change our teenage population for the better. 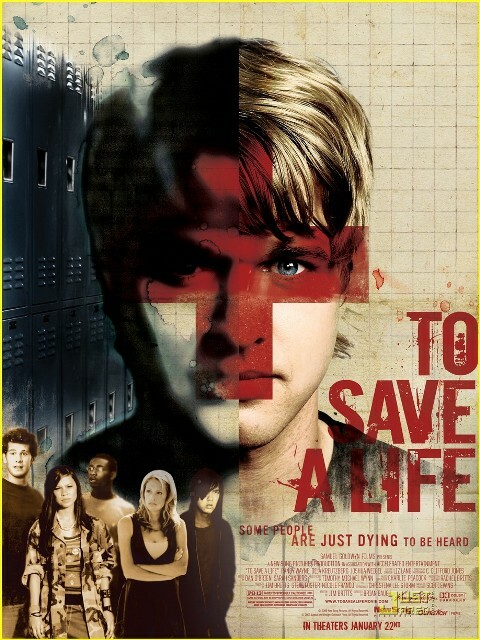 To Save A Life was created by New Song Pictures and Outreach Films, and is distributed through Samuel Goldwyn Films. After opening on 441 screens this weekend, the film will continue to open in new markets in the coming weeks. An all-star athlete and his girlfriend find their lives spinning out of control when Jake loses a childhood friend. Help comes when he reaches out to others who are hurting, and he realizes some people are just dying to be heard. Samuel Goldwyn Films is a major, independently owned and operated motion-picture company that develops, produces and distributes innovative feature films and documentaries. The company is dedicated to working with world renowned and emerging writers/filmmakers and committed to filmed entertainment that offers original voices in uniquely told stories. This steadfastness is best exemplified by the Academy Award® nominated SUPER SIZE ME, AMAZING GRACE and Julie Delpy’s hit comedy 2 DAYS IN PARIS. Goldwyn’s past slate included PRICELESS, a romantic comedy starring Audrey Tautou, Academy Award® winner Claude Lelouch’s ROMAN DE GARE, the critically hailed ELEGY starring Academy Award® nominee Penelope Cruz and Academy Award® winner Ben Kingsley and the box office smash FIREPROOF. New Song Pictures is proud to release TO SAVE A LIFE, their debut production. New Song Pictures is based in Oceanside, CA, and seeks to make films that tell relevant stories while being encouraging and uplifting. Seems good thriller movie!Haven’t seen yet but after reading your post i can’t wait to see this movie.Ne ways thanks for sharing your reviews. Some time little movie has very good concept and strong appeal.I read your nice informative blog,will like to see this movie soon.I always like movie which has good concept and direction.